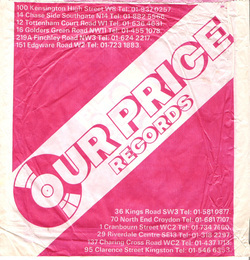 Everybody knew Our Price as the place to buy your singles and albums from years ago. Watford had two stores in the town centre, one up the top end of town and the other in the Harlequin centre. St. Albans' Our Price was on two floors but not that welcoming, from what I rememeber and always quite expensive! (May 2, 2013) JohnW said:I My take on Our Price in Watford goes back a little further than this. As I recall, it's first foray into Watford High Street was as a concession inside a clothes shop about where Maplins is now. I distictly recall buying Jane Aire's album there so it must have been late 1979 or 1980. That shop only seemed to last a few months and the one at the top of the high street opened and another one (almost next door to Woolworths) opened around the same time. Next door to the one at the top of the high street there was an empty unit that opened as a bargain bin store a few times where all the remaindered albums went. Then I moved just before the Harlequin opened and lost track.